John Harden Allen ( 1847 - May 14, 1930 ) was an American minister. He was associated with the Church of God (Holiness), and is also heavily associated with British Israelism. He came from Illinois, later moving to Missouri in 1879. Originally a pastor in the Methodist Episcopal Church, he later became a pastor in the Wesleyan Methodist Church in California. He was one of the co-founders of the Church of God (Holiness) in 1883. He “evangelized throughout the West and eventually moved to Pasadena, California, where he died”. Around 1917 he produced a publication entitled Stone Kingdom Herald. 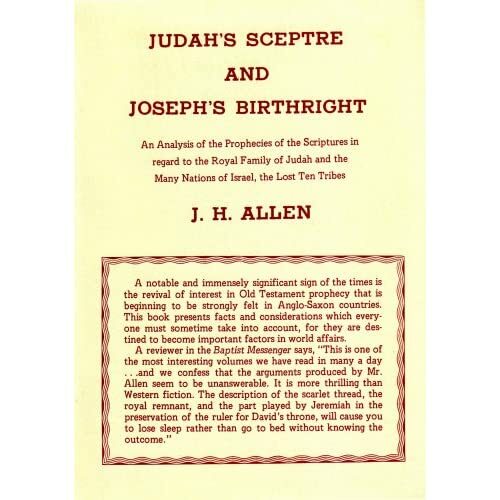 Allen is best known for his book titled Judah's Sceptre and Joseph's Birthright, which many have claimed formed the foundation for the teachings on British-Israelism of Herbert W. Armstrong. While the works of Allen and Armstrong are by no means identical, with Allen's work being much earlier, much longer and in hard-back book format, the core of Allen's work does appear to have served as inspiration for Armstrong, and Allen's book was not unknown to Armstrong's students at Ambassador College. There are many similarities between the two works, and in some places they are nearly word-for-word the same. Hi thanks for this, always find ABC literature interesting(although I disagree with some of the content)so hopefully this wont disapoint. Hi thanks for this, always find ABC literature interesting(although I disagree with some of the content)so hopefully this wont disapoint.God Bless. Your welcome. No problem with disagreement in some of the content. It is for those who study - word by word, and chapter by chapter. When YAHSHUAH comes at the last trump those two sticks 'will' be joined once again. Thanks for the extra information from Wikipedia. After uploading I thought to find more information. In any study, "Always" look to the word of FATHER (The KJV version, I recommend myself) for proofs.